Pieter BUSTIJN: IX Suittes pour le Clavessin (1721). Steven Devine (hpsi). Zefir ZEF 9626 (1 CD) (http://www.zefirrecords.nl/). 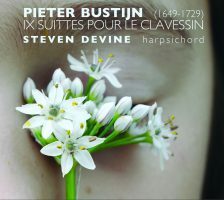 Bustijn (1649-1729) is perhaps the best or most accessible example we have today of Dutch music in the Baroque era. The nine suites pass quickly. Most movements are under 90 seconds and are organized as multi-movement dance collections starting with a Prelude, spanning moods and styles, and ending with a fast Giga or similar. They are not harmonically complex but tuneful, suggesting arrangements of popular melodies over modest contrapuntal accompaniment. It is said that Bach possessed a copy of these Suittes. Now and again they sound French (Allemanda and Giga of No. 2), and there are moments that suggest Handel (No. 3’s Preludio), Bach warming up at the organ (Preludio of No. 4), or even the latter’s lute suites (Aria in No. 6). The Allemande of No. 8 offers a charming melodic and harmonic device. Devine plays a 2000 Colin Booth after a 1710 Fleischer. Bolder and more confident than Alessandro Simonetto’s tinnier recording (Brilliant Classics 94187). 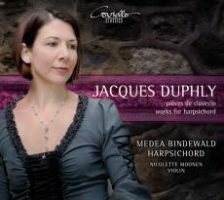 Jacques DUPHLY: Pièces de clavecin: Var. excerpts from Books I, III and IV (1744, 1756, 1768). Medea Bindewald (hpsi), Nicolette Moonen (vln). Coviello Classics COV 91404 (1 CD) (http://www.covielloclassics.de/). Bindewald provides 15 tracks, alternating clusters of solo harpsichord pieces with two groups of three from Book III where a violin joins in to create mini suites or “sonatas”: Ouverture, La de May and La Madin, and La de Casaubon, La du Tailly and La de Valmallette. Moonen is captured a hair too forward, as if these were violin sonatas, when in fact the violin ought to be perceived as accompaniment or even afterthought. Bindewald proceeds deliberately; the 2006 Keith Hill modeled on a 1730 Blanchet is appropriately grave and resonant for La Pathoüin and La Forqueray. Throughout, she will tweak tempos to heighten drama or harmonic motion revealing an intimate understanding of the music. A quartet from I: Allemande, La Bouçon, a graceful Rondeau, and La Millettina is well shaped. Bindewald stays away from Duphly’s Classical pieces in Book IV, offering just La De Vaucanson and the gloomy though familiar La Pothoüin. For a closer, Bindewald picks the aptly named Médée, whose bold middle register, ornaments and slight Spanish flair epitomize the culmination of the French Baroque. John JONES: Eight Setts of Lessons for the Harpsichord (1754); Brilliante from Lessons for the Harpsichord (1761). Mitzi Meyerson (hpsi). Glossa GCD 921808 (2 CDs) (http://www.glossamusic.com/). Recording for Glossa, Meyerson has been exploring less travelled harpsichord repertoire. This release (recorded in Dec. 2010) is not to be confused with Meyerson’s release of Richard Jones (? 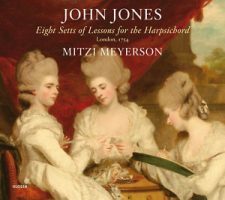 – 1744) whose six Sets of Lessons for the Harpsichord (1732) is on Glossa GCD 921805. Like other English composers of his day, John Jones (1728-1796) has been overshadowed by Handel. Although published as a group, there are clear stylistic differences between the lower- and higher-numbered Setts. The individual movement titles indicate that Setts are distinct from Suites. There is an opening slow movement (Allmand, Larghetto, etc. ), then a selection of dance movements (Siciliana, Corrante, Gig, etc.) alternating with other Italian designations (Allegro, Andante, Moderato, etc.) and closing with something bright and perky. Nos. 4, 6, 7 and 8 are tracked as four movements, and the latter two resemble Classical sonatas. Perhaps others may find English qualities or Handelian characteristics (especially in No. 4), but I hear more continental styling and connection with Rameau, despite the lack of French ornaments. The Vivace in No. 2 and the Sarabande in No. 3 skillfully employ canons, not unlike Haydn, which stand out unexpectedly from what are mostly tunes over accompaniment. Using the doubling available on a robust Michael Johnson from 2011, Meyerson will expand what looks to be unornamented octaves into bold statements. Thus No. 7’s Allegro looks bland on the page, but becomes especially riveting. As if to emphasize the nearing Classical period, No. 8 takes on an operatic strut. Here Meyerson delineates a possible solo and tutti design. There are two CDs (51:02 + 56:02). Jacques DUPHLY: Première Livre de pièces de clavecin (1744); Deuxième Livre de pièces de clavecin (1748); Troisième Livre de pièces de clavecin (1756); Quatrième Livre de pièces de clavecin (1768). Pieter-Jan Belder (hpsi), Rie Kimura (vln). Brilliant Classics 94999 (4 CDs) (http://www.brilliantclassics.com/). 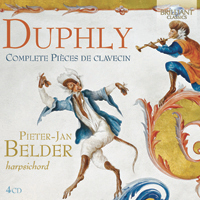 Duphly’s Second book was published just four years after the first in 1744, and we discover that the composer’s style developed vividly towards the decade’s end. The First book’s two Suites in D and C are modeled on Couperin and Rameau, whereas the Second book collects 14 diverse character pieces opening with the vigorous La Victoire (which in Saint-Saëns’ day had been attributed to Rameau) and including the binary structured La Lanza which suggests acquaintance with Scarlatti’s Sonatas. Book II explores the harpsichord’s timbres more deeply – the bass tones of the morbid and contradictorily titled La Felix, a flirtation with the high E in La De Vatre. How strange the chromatic scales in La De Vatre must have sounded! Belder does not dwell, and keeps his rubato in line and his tempos on the perkier side. Six pieces in Book III ask for violin, sounding not unexpectedly like Rameau’s Pièces de Clavecin en Concerts, especially La de Casaubon. Kimura finds the right balance as extra stringed accompanist to the keyboard. These pieces do not showcase the violin, and require a neutrality perhaps foreign to violinists. The solo pieces can be more exhilarating, especially the aggressive bass parrying in Médée, in a potentially dissonant F minor, and the contrasting treble of Les Grâces. Book III spills onto the fourth disc, preceding Book IV’s seven pieces. Similar to the stylistic distance between I and II, the last book represents a departure from III’s distinctly French character pieces towards a gallant, Italianate Classical style with omnipresent Alberti basses and frankly less passionate sparkle. Duphly’s published oeuvre reflects what was fashionable, and towards the end of the 1760s unornamented melodies over blocked accompaniment prevailed. Only two of the seven, La De Vaucanson and La Pothoüin, fit Book III’s high French Baroque style. “Il Cembalo di Partenope.” Var. comps. Var. pieces. Catalina Vicens (hpsi). 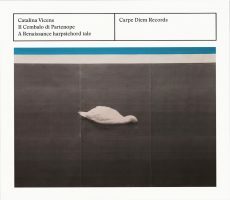 Carpe Diem Records CD 16312 (1 CD) (http://www.carpediem-records.de/). Even if this weren’t the world’s oldest functioning harpsichord, the program would grab one’s attention. Vicens offers 24 tracks that might have been heard “in and around” 16th-century Naples, whence this harpsichord originated. The maker is unknown, but this Neapolitan instrument has been dated to ca. 1525, and presently lives in the National Music Museum in Vermillion, South Dakota. The two dozen pieces played are collected from eight sources: Antonio Valente’s Intavolatura de cimbalo (1576), Capirola Lutebook (ca. 1517), Coimbra MS 242 (ca. 1570), Andrea Antico’s Frottole intabulate da sonare organi (1517), Joan Ambrosia Dalza’s Intabulatura de lauto (1508), MS Castell’Arquato (16th cent. ), Marco Antonio Cavazzoni’s Libro primo (1523), and Philippi Hainhofer’s Lautenbücher (1603-04). Almost all the works have known authors, including the composers / compilers above as well as others, such as Bartolomeo Tromboncino, Marchetto Cara, et al. The pieces are predominantly strophic song settings. As an extra, or rather, as a companion and different window onto the music and instrument, there’s a downloadable audiobook realization (38:30) of Vicens reading her historical fantasy, whose text is included in the booklet, accompanied with several tracks from the release. “La Famille Forqueray: Portraits(s).” Antoine FORQUERAY: Prélude (1720s? ); Suite pour trois violes (1720s? ; arr. Justin TAYLOR, 2016). Jean-Baptiste FORQUERAY: Première and Cinquième Suite (1747). François COUPERIN: La Superbe ou La Forqueray from Book III, Ordre XVII (1722). Jacques DUPHLY: La Forqueray (1756). Justin Taylor (hpsi). Alpha 247 (1 CD) (http://outhere-music.com/). 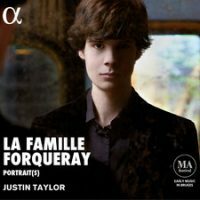 Taylor emphatically reminds that the Forquerays, Antoine and his son Jean-Baptiste, were revered by their contemporaries. This recital mixes Couperin and Duphly’s homages with two of the Suites Jean-Baptiste assembled from his father’s music in the arrangement for harpsichord solo. Presumably there will be a subsequent volume with the remaining three Suites and Rameau’s homage. Taylor demonstrates agility and spirit, not unlike Borgstede (Brilliant Classics 94108). His tempos are demure but not bizarre like Rannou (Zig-Zag Territoires ZZT080301.2 and just reissued as Alpha 322). The inclusion of the unmeasured prelude and his own arrangement of the pieces for three viols indicate a desire to strike out differently. The “cadenza” in Duphly’s La Forqueray is particularly fine. Taylor plays a breathtakingly resonant Ruckers-Hemsch. Could this be the same instrument Rannou used for her Forqueray?